Photo courtesy of Redwood Coast Tsunami Work Group a King Salmon Tsunami-Ready declaration at the Board of Supervisors chambers in 2011. 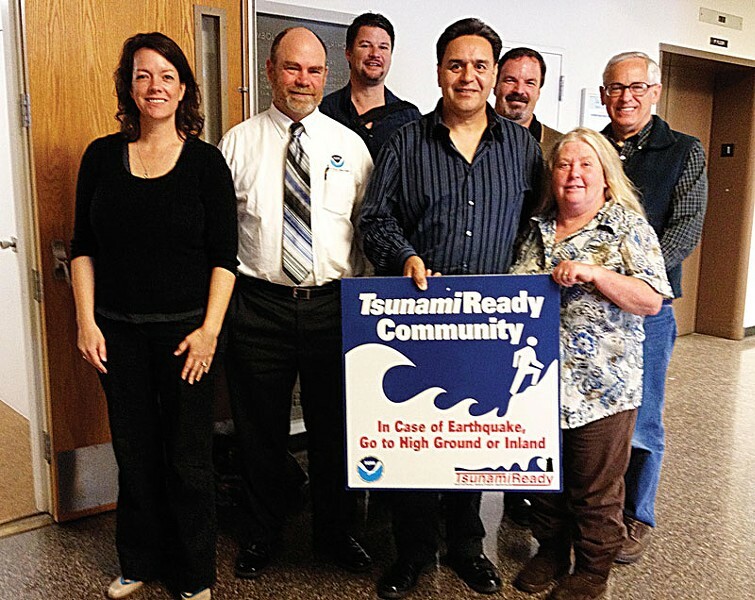 From left to right: Allison Talbot (Pacific Gas & Electric), Troy Nicolini (National Weather Service), Kevin Miller (California Office of Emergency Services), Roberto Arroyo (PG&E), Rick Wilson (California Geological Survey), Kathy Moley (Pacific Watershed Associates) and Dan Larkin (Humboldt County Office of Emergency Services). File Photo Carolyn Crnich scans ballots for the first-of-its-kind Humboldt county election transparency project. 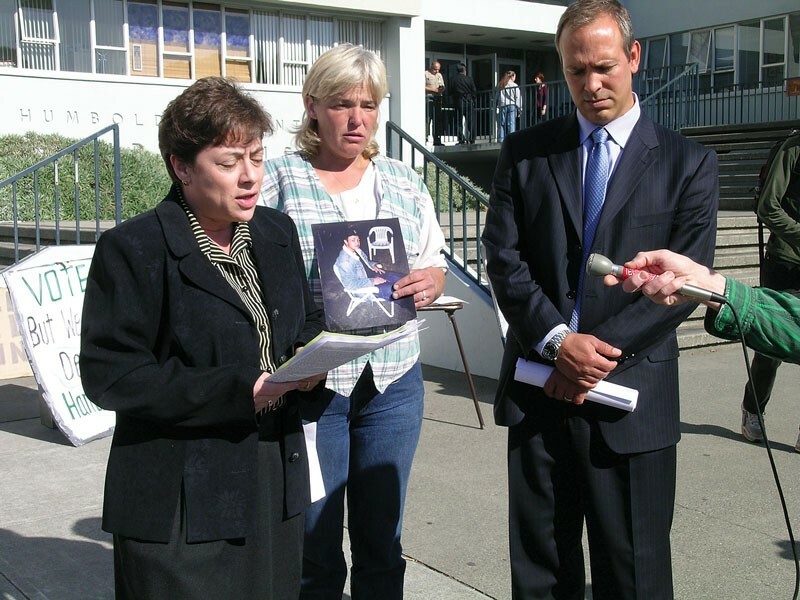 file photo Gallegos at press conference after the 2006 shooting of Christopher Burgess by Eureka police. File photo fearing his employees’ workload was unsustainable, Parris recommended his office be consolidated with that of the sheriff. 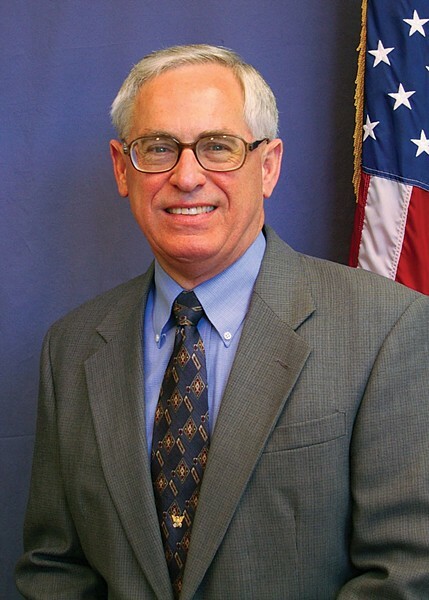 It seems like Humboldt County might be running out of golden watches, like one can't turn a corner without bumping into another official who's on the way out. After all, a pair of sheriff's office stalwarts — lieutenants Steve Knight and Dave Morey — recently rode off into the sunset, and County Counsel Wendy Chaitin plans on checking her briefcase at the door at the end of the month after 23 years on the county's payroll. And that's in addition to the departures of four high-profile game changers. It's enough to make one wonder, is this an unprecedented exodus? "No, I wouldn't say so," says County Administrative Officer Phillip Smith-Hanes in an email to the Journal. "In the last 10 years, we've turned over every member of the board and all but one of the department heads (in some cases, more than once)." But not all departures are created equal. The county's work will go on — two elected officials have already been sworn in and national searches are underway to fill another pair of vacancies. As Smith-Hanes works to steady the ship, now seems a fitting time to look back on the legacies of four officials whose tenures in Humboldt have left indelible marks. Dan Larkin retired Dec. 19 from his post as manager of the Humboldt County Office of Emergency Services. But don't panic! Larkin joined the county just as the world lurched toward possible digital disaster. It was January 1999, fewer than 365 days 'til the millennium — the dreaded "Y2K," when computers, programmed to display years in two digits not four, might toss us back to 1900 on Jan. 1, 2000, bringing infrastructure chaos. Computer nerds were solving the problem, but public hysteria was high, with some folks threatening to grow rutabagas. The OES, meanwhile, was on shaky ground, and practically friendless, after a rough year under a prickly director, says Humboldt State University geology professor Lori Dengler. "Let's say that [this former director] did not smooth the waters," says Dengler. "His way of operating was to really amp up a situation. He was provocative in his statements. He was critical." Plus, the county's emergency plans were seriously out of date or incomplete. Larkin was like a cool compress and a shot of adrenalin. "What I appreciated about him was this wonderful sense of calm and quiet efficiency," Dengler says. "Dan has this very straightforward, very quiet and very direct way of communicating. And he understands the system; he figures out how to get things done within the system rather than butting his head against it." Larkin's job was to help the Sheriff direct emergency organization efforts in the county "operational area" — cities, towns, unincorporated areas. His master's degree in business administration and 11 years as an insurance claims adjuster helped, he says. And he'd spent 31 years in the military, four running air combat operations for the Navy during Vietnam and the remainder working in operations and search and rescue for the Navy Reserve and (for 24 years) the Coast Guard Reserve. "I like the management side of business," Larkin says. "And I like the operations side — the doing part." He jumped into disasters, beginning with that first year: the dredge Stuyvesant's fuel-oil spill near the mouth of Humboldt Bay that killed thousands of birds and other wildlife; and the Megram Fire that burned from Trinity County into Humboldt and smothered Hoopa and Willow Creek with toxic air for weeks, spurring Larkin to help set up information kiosks and coordinate evacuations. And then there was Y2K. Advance preparation paid off, says Larkin — he and about a dozen other employees and their families hunkered down with pizzas and drinks in the emergency operations center in the basement of the courthouse that New Year's Eve, watched on TV as the millennium first arrived without calamity on the other side of the world, climbed to the roof at midnight to watch the fireworks, and around 3 a.m. called "all clear" and went home. Larkin also jumped into planning. He started regular operational meetings, where folks from all levels of government and various nongovernment organizations swap information and map out coordinated emergency response plans. He set up volunteer disaster coordinators in each community. In late 1999 he sent 73 Humboldt people to Emmitsburg, Maryland, to train with FEMA for a Cascadia earthquake event — you know, the Big One. He updated the county's master emergency operations plan, a 500-page document that lays out the specific duties of each county department in an emergency. He updated the emergency alert system. After Sept. 11, 2001, he obtained $6 million in Homeland Security grants which helped pay for local fire districts' equipment, an incident command vehicle, a robot for the Sheriff's bomb squad, two new search and rescue teams (urban and rough terrain) and numerous other county, city and district needs. Larkin, with others, also improved and wrote new contingency plans — for earthquakes, fires, floods, volcanic ash fallout (a faint but costly threat), dam breaks (pertaining to six dams on four of our rivers), tsunamis and more. These plans contain everything from geologic background and templates for signing in evacuees (including animals) to instructions on how to clean ash-coated electrical insulators (from the bottom up, with de-ionized water) and the names of farmers to call to notify them of rising river water in time to move their livestock. 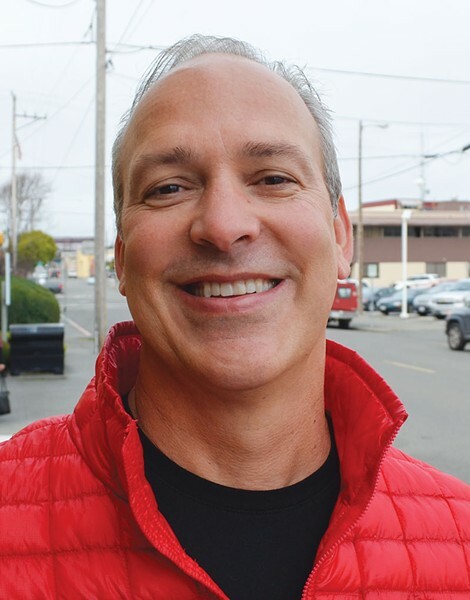 Larkin, with the Redwood Coast Tsunami Work Group, helped expand the county tsunami plan from, as he characterized it, "Hey, there's a wave coming, get out of the way," to a detailed program that's a model for other coastal communities. In 2007, he sent another 78 folks back to Maryland, this time for FEMA's first-ever tsunami training. Dengler, who helped develop the class, says everyone returned from the training excited. Together they churned out tsunami inundation and evacuation maps, installed tsunami sirens and signs showing the boundary between tsunami and non-tsunami zones, and implemented a tsunami education program. 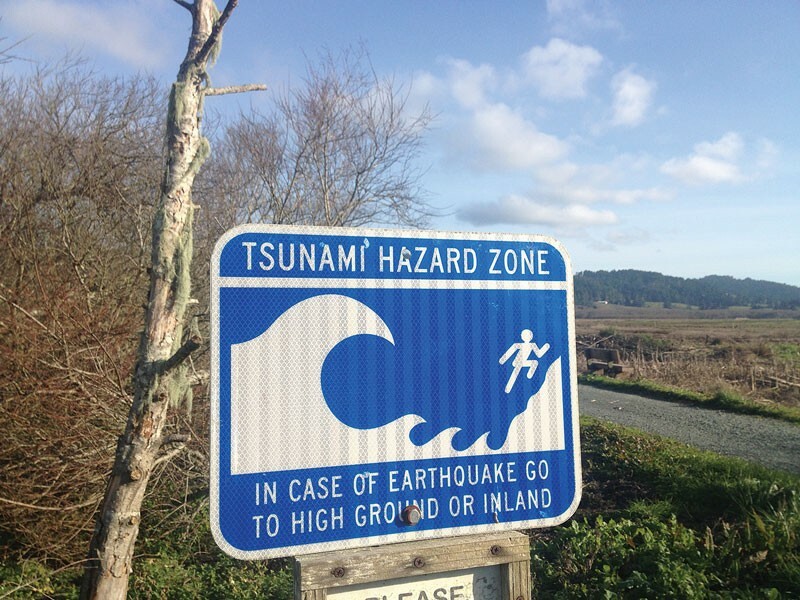 National Weather Service meteorologist Troy Nicolini admires Larkin's "courage to take risks" — such as convincing county supervisors to let Humboldt be a guinea pig for the National Weather Service's "live code" test of the national tsunami warning system. Until 2008 the service used test codes, which unlike live codes (used for real tsunamis) don't trigger public alert bulletins and sirens. Live code tests, some feared, could incite dangerous panic — like the time a friend of Nicolini's heard about a tsunami warning in the South Pacific, "drove 90 miles an hour over the Samoa Bridge and got a ticket." But live code tests could be used, with advance education, to get the public involved in practicing tsunami drills. The county's been doing live code tests without incident ever since. Larkin, says Nicolini, is the guy he'd call at 2 a.m. to report that the Eel River was going to flood, or that there'd been a 9.0 earthquake off the coast of Japan. He's the guy, says retired Humboldt County Sheriff's Lt. Steve Knight, whose work for the county will be saving lives long after he's gone. He's the guy his friends call "the master of disaster," says retired Sheriff's Sgt. Phil Buihner, adding, "If there's a disaster, Dan's the man you want to keep around." Not to worry: The county's planning to fill his position, and until then Larkin figures he'll likely keep working part-time. He plans to stay involved with the tsunami work group, too. But he hopes at some point to truly retire: He and his wife have lots of traveling to do, and there's a '33 Ford dump truck and a '74 Corvette waiting for him to restore them. It was November 2012 and Ferndale's mayoral race had come down to the wire, with then-Councilman Stuart Titus holding a five-vote advantage over challenger Ken Weller. Recently retired Humboldt County Clerk/Recorder and Registrar of Voters Carolyn Crnich recalls a telephone call shortly after that final tally was announced. It was from someone who'd just talked to Weller and inquired if he was going to seek a recount. "'Nah,' he said. 'If Crnich counted them, it's good enough for me,'" she says with a chuckle. Crnich isn't being boastful, and is quick to say that Weller's confidence had little to do with her and just about everything to do with the groundbreaking election infrastructure built under her watch. While there are a host of achievements that can be pointed to during her tenure, it seems Crnich's legacy will ultimately rest on her efforts to help put our small county on the forefront of election transparency. Back in 2002 — while much of the nation was still bitterly recovering from Florida's hanging chads and a presidential election decided in part by the U.S. Supreme Court — the Humboldt County Board of Supervisors decided the county's registrar of voters should be elected, not appointed, and folded it into the position of clerk and recorder. That put Crnich, who'd been elected the county's recorder in 1990 and taken on county clerk duties in 1996, in the thick of it. Crnich admits she knew very little about elections or election technology at that point, but says she pledged to become a quick study, and leaned heavily on then Elections Manager Lindsey McWilliams. The industry-wide push at the time was for electronic, touch-screen voting, the thinking being there's no hanging chad with a touch screen. However, Crnich was leery, uncomfortable simply taking a computer's word for Humboldt's elections results. Instead, she wanted a system that left a paper trail — paper ballots that could be recounted if necessary. So Crnich bucked the industry-wide trend and kept the optical scan ballots that see voters color in ovals before passing their ballots through a mechanical scanner. But national elections in 2004 and 2006 continued to fuel questions about election technology and transparency. It was against this backdrop that two local commercial fishermen, Dave Bitts and Kevin Collins, approached Crnich with a revolutionary idea: Why didn't the county, after counting all the ballots, just take pictures of them and post them online? That way, they said, anyone wanting a recount could just count the votes for themselves. "My first thought was, 'These guys have just been spending too much time out on the water listening to the radio,'" Crnich recalls. "But I thought it was my responsibility to listen to them. I spent a lot of time studying and found that they weren't wearing tinfoil hats or anything." The more Crnich thought about the idea the more she liked it. Soon, she nabbed a grant to pay for an optical scanner to photograph all the ballots and got local programmer Mitch Trachtenberg on board to create some open-source vote-tabulating software. The Humboldt Election Transparency Project got up and running officially in 2008 and instantly netted results, finding that more than 200 votes had been mysteriously purged from Humboldt County's official tally for the November 2008 election. The project helped uncover what's now known as the "Deck Zero Bug" in Diebold's election equipment — a bug that ultimately led to the equipment's decertification in the state of California. It's also worth noting that Humboldt hasn't seen an official recount since the project launched. Tom Pinto, an early champion of the project, says he's spent his career in government and has seen plenty of cautious officials. Crnich, he says, has been a breath of fresh air. "What she's done, she didn't have to do it," he says. "She went the extra mile and she was willing to go against the grain." While the first-of-its-kind transparency project has captured the headlines, it's just one of a list of things Crnich points to when talking about her tenure. Crnich, a born-and-raised local who graduated from Eureka High School in 1969, got her first county job as a title clerk in the assessor's office but said she'd never thought of running for public office until her boss, Grace Jackson, took her to lunch one day, told her she was retiring and asked Crnich to run for her post. Twenty-four years later, Crnich says the key to her tenure was hiring really good people — "bright people who are interested, intelligent and engaged in their work." Together, Crnich says she and her staff were able to keep up with the flow of technology to make the clerk, recorder and elections offices as transparent and accessible as possible. Crnich says she's also consistently tried to evaluate everything her offices do, with an eye on local impacts. A handful of years ago, she pushed Times Printing to get certified by the California Secretary of State's Office to print ballots. Now, instead of spending $250,000 every election to get ballots printed out of state, that money stays in the local economy. Similarly, when remodeling the recorder's office, Crnich commissioned a local woodworker to craft the furniture out of solid white oak. She also asked that the office — perched on the fifth floor of the Humboldt County Courthouse — be designed so it allowed the public to access a row of floor-to-ceiling windows that offer one of the county's best views. "I'm proud of the look of that office," Crnich says. But Crnich says she's now happy to be slowing down, joining her husband in retirement. She's looking forward to turning on the radio and easing into a knitting chair in the parlor of her Loleta home, she says. But she doesn't plan to entirely close the door to public service. "I'm going to be a poll worker, if they'll have me," she says. Paul Gallegos was a polarizing figure in Humboldt County politics from the moment he ousted long-time District Attorney Terry Farmer, Gallegos' youth and surfer aesthetic standing in sharp contrast to Farmer's stern law-and-order presence as the county's top attorney. On a recent morning in his Cutten home, Gallegos reflected on his 12 years as the DA, saying that from the beginning he planned to make difficult and unpopular decisions, even if they cost him his job. Gallegos is affable and thoughtful, inserting philosophies and metaphors into his conversation. His management style, possibly because of his paced, hands-off approach, garnered criticism from the beginning. A grand jury in 2005 said Gallegos had ineffectual leadership, though he says poor management is an easy criticism because it's "amorphous." Gallegos says being a manager means dealing with people with different outlooks. "There are as many ways to be a boss as there are people." He says he wasn't a micromanager — that he helped define goals and guidelines and stood out of the way. "For many I was not a good boss. ... Some people need structure. [But] some people are perfectly fine and even better when given the opportunity to fly." Early in his tenure Gallegos courted controversy by suing the Pacific Lumber Co. for fraud on behalf of the county. At the time, he says, he was certain that decision would cost him his job. "I think it was the right thing to do," Gallegos says. "I think we had to do it." The lawsuit was thrown out by a judge and fueled a recall attempt (funded largely by Pacific Lumber Co.'s CEO Charles Hurwitz). Gallegos defeated the recall, further crystallizing his factions of supporters and detractors in the process. In 2006, Gallegos secured a grand jury's criminal indictment of two Eureka Police Department commanders on charges of involuntary manslaughter after a standoff led to the SWAT team's fatal shooting of Cheri Lyn Moore. That case was ultimately tossed by a local judge, who found Gallegos misrepresented the law to the grand jury and didn't present it with evidence of the officer's potential innocence. Despite the failed outcome of those controversial decisions, Gallegos' willingness to take on two of Humboldt County's oldest power structures helped earn him enough support to win reelection in 2006 and 2010. But law enforcement agencies didn't take kindly to the EPD indictments. "Sometimes doing your job does make things more difficult," Gallegos says. So he focused on the DA's investigative department, seeking to build a unit that would assist law enforcers around the county and assist his office in getting the investigative materials it needed to win cases. That didn't come without its own controversies; Gallegos came under fire from the county and community for seeking to purchase AR-15 rifles for his investigators. Those weapons, along with body armor, were no different than the arms that any law enforcement agency has at its disposal, Gallegos says. Still, he stands by the investigators, saying they both cracked some important cases and educated other police forces about evidence regulations and other issues facing prosecutors. Way back in 2002, Gallegos campaigned on the promise that he would reexamine how the county prosecuted marijuana cases. It was a time of uncertainty; the Compassionate Use Act (Proposition 215) had legalized medical marijuana six years earlier, but there was next to no legal infrastructure for attorneys to differentiate legal and illegal marijuana grows. "There was no guidance," Gallegos says. "Law enforcement was pretty much set against [marijuana]." Gallegos developed guidelines to help his attorneys prosecute marijuana cases, which he says were widely misconstrued and became a source of controversy. But he says he was frustrated that Humboldt County couldn't come up with stronger regulations on marijuana cultivation. "I can make prosecution guidelines. But supervisors and legislators can make rules and regulations. I don't get to make law," Gallegos says. "I have been arguing since I've been in office for someone — or groups of people — to step up and make those tough decisions for this community. But no one wants to do it." From the beginning, Gallegos says, he supported legalizing marijuana, and says a seismic shift has occurred in the local law enforcement community — albeit slowly — toward approaching marijuana as an environmental and regulatory issue as opposed to a criminal drug issue. Gallegos says there are decisions that he'd make differently, in hindsight, but "no real regrets as it relates to the job except the things I didn't get to get done." Personally, he says he realizes, now that his oldest son left home to attend college in Oregon, that he was absent for much of his kids' youth. "It would have been cooler to spend a little more time with that guy." Gallegos says it was a privilege to serve the county. "I knew why I was there and who I served," he says. And he's cautiously optimistic. "Humboldt County is an awesome place. Our greatest resource is us. We need to be less motivated to ID problems and be more motivated to ID solutions." 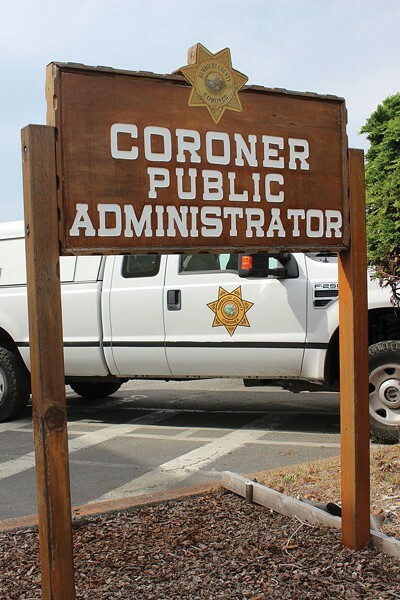 Make no mistake about it, Humboldt County Coroner Dave Parris' legacy is one of subtraction. He will go down in history as an integral component to the county Board of Supervisors' recent decision to eliminate the county's stand-alone coroner's office in favor of consolidating it with that of the sheriff, creating a single sheriff/coroner elected position. Just months after being elected to serve a third term in June, Parris announced in November that he would be retiring at the end of January — one month into his new term — and publicly endorsed the consolidation. A short time later, the supervisors unanimously approved the move. Parris, who was appointed to the position in 2009, has been vocal about the challenges facing the office ("Last Rites," Sept. 25, 2014). He says a lack of county funding has left his staff seriously overworked, with him and three deputy coroners traversing all of the county's 4,000 square miles at all hours of day and night to investigate the hundreds of suspicious deaths recorded annually. In addition to the physical grind of the job, Parris says the emotional aspects of dealing with decedents' families can be overwhelming. "There have been days when I've had to send my entire staff home because of the trauma and the emotional toll," he says. Parris says he began to seriously worry that if the county couldn't take care of coroner's office employees and do something to lessen their burden, their work would start to suffer, leading to a diminished service to grieving families. Consolidation, he says, promises to bring additional resources to the office, bringing more help to deputy coroners and more funding to update the infrastructure they depend on. As a quick example, Parris points to an identification database that's accessible by law enforcement agencies wanting to check Department of Motor Vehicle and other state records. It used to be that deputy coroners seeking help in identifying a dead person or tracking down his or her family would have to call someone at the sheriff's office and have them look up and fax over the records. With consolidation, Parris says the deputies will be able to access the records directly. Parris says he knows some in the community may be concerned over losing the coroner's function as an independent check on law enforcement in the event of officer-involved fatalities. But Parris says the office's most powerful tool to this end — the calling of a coroner's inquest, as was done with the 2006 shooting death of Cheri Lyn Moore — has been used very infrequently and, with the office's current staffing and funding, would be almost impossible to do. He says he's hopeful that the county's Critical Incident Response Team — a multiagency group that responds to investigate critical incidents under a protocol Parris helped author — has eliminated some of the need for such a function. "I think a lot of people are buying into the critical incident team and its ability to operate independently," he says. Looking back on his time in the coroner's office, Parris says he's most proud of the volunteer program he helped set up that trains citizens to be autopsy technicians. Under the program, the county has a pool of about 40 citizens who have been trained to help forensic pathologists administer autopsies by acting as their assistants and recording their findings. In addition to relieving the office of the need to have a deputy coroner present for all autopsies — freeing them up to work their cases — Parris says the program has seen volunteers gain valuable experience. "That might be my most important accomplishment," he says.Parris says his time as coroner has been chock full of profound emotional experiences as he's helped families through tragic events, often entering people's lives when they are at their worst. Overall, Parris says, it's rewarding — if taxing — work. But, he says, he's ready to move on, noting that he's expecting a grandson in the coming months. "I'm absolutely thrilled to know I won't be called out in the middle of the night when he's on his way," Parris says. 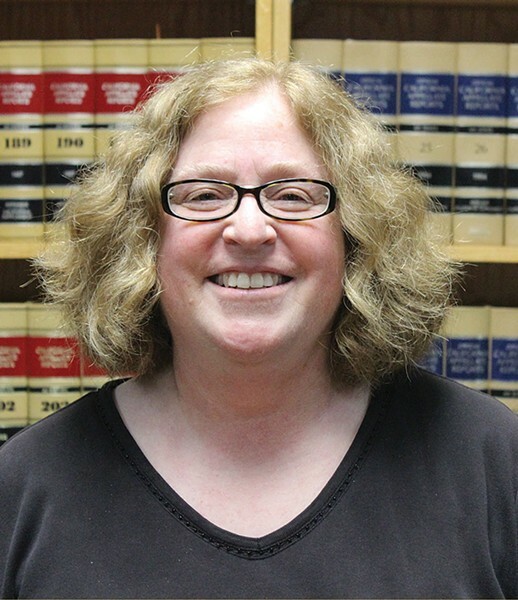 After 23 years of providing legal advice to the county — including the last seven as chief county counsel — Wendy Chaitin is retiring. Because her greatest achievements probably lie in the confidential dustbins of the county courthouse — that horrible liability avoided, the Constitution-stomping ordinance that never came to a vote or that lawsuit quietly settled before it bubbled into public view — Chaitin's legacy is hard to pinpoint. For her part, she says it's been an honor and a privilege advising the board and county department heads for all these years but that she's looking for a more stress-free existence in retirement. When it comes to naming her greatest achievement, Chaitin points to two. First, she says she's very proud of the staff she's put together in her office — a wonderful collection of "extremely knowledgable, bright and dedicated people." Second, Chaitin says, is just having been able to keep up with the workload that stampeded her desk on a daily basis. "You come in and you have a list, 'I'm going to do one through five today,'" she says. "Then, you end up doing A through Z that have nothing to do with one through five. There's just so many little brush fires that need to be put out." 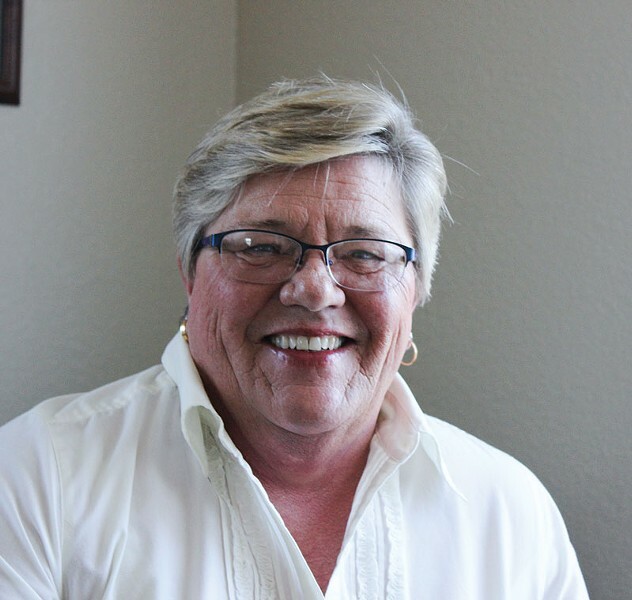 Carolyn Crnich — Kelly Sanders, a nine-year veteran of the Humboldt County Elections office, ran unopposed for Crnich's seat, with her former boss' endorsement. Paul Gallegos — Maggie Fleming, a former prosecutor in Humboldt and Contra Costa County, took 61 percent of the vote to trounce three opponents and win election in June, making her the county's first female district attorney. On the campaign trail, Fleming touted her widespread support from law enforcement, including the endorsements of numerous local cop unions. Dan Larkin The county is in the midst of conducting a national search for Larkin's replacement. 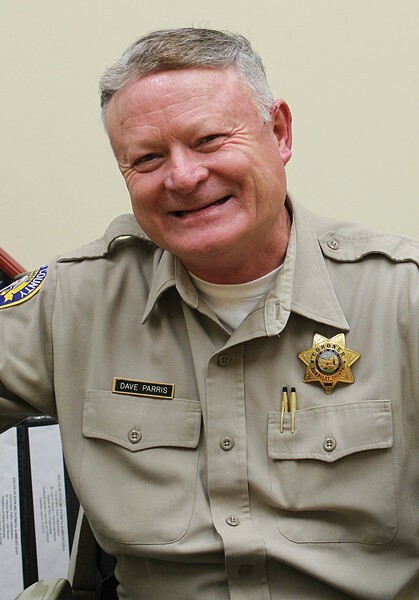 Dave Parris After hearing of Parris' retirement, the Humboldt County Board of Supervisors voted to consolidate the coroner's office with that of the sheriff, making sitting Sheriff Mike Downey the county's first sheriff/coroner.